As from 1st August, Glass's Guide will offer a greater spread of used car valuations, and greater accuracy, both on line and in its famous 'book'. Values will continue to be split by year and letter, so 2011/60, 2011/11, 2011/61, 2012/61, 2012/12, etc. The guide will give original list price, retail asking price, average trade price, then three furthar trade prices calclated to reflect different condition levels. Grade Hi: The typical value for cars that would benefit from slight cosmetic work in line wityh the higher auction grades. Grade Av: The typical value for cars that would benefit from a significant amount of cosmetic work and some bodyshop attention in line with the mide-auction guide. Grade Lo: The typical value for cars that would benefit from a significant amount of cosmetic and bodyshop attention in line with the lower auction grades. Trade prices are based on 1,300,000 observed trade prices achieved per year. 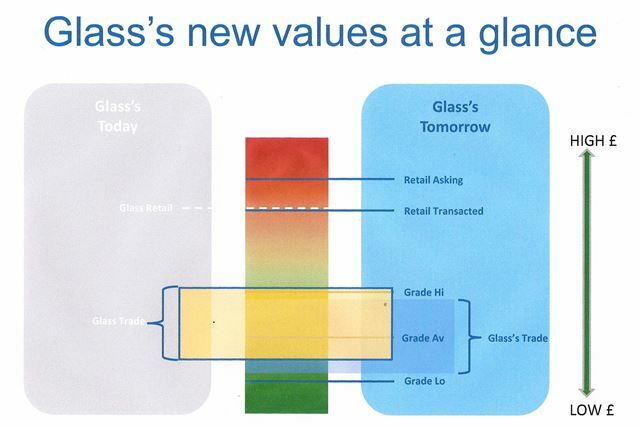 Glass's Retail Asking Price is calculated from 4,000,000 observed retail asking prices per year.